Cortona is a small charming town in the Valdichiana, or Chiana Valley, in the province of Arezzo in southern Tuscany. The city, enclosed by stone walls dating back to Etruscan and Roman times, sits on the top of a hill about 600 meters (about 1968 feet) above sea level. This dominant position over the valley offers a spectacular view from all over the town of the surrounding valley and even Lake Trasimeno. The city is small but offers many interesting places to visit, among these the Diocesan Museum (where you can admire a beautiful panel painting of the Annunciation by Beato Angelico) and the MAEC (The Etruscan Academy Museum of the City of Cortona), where it is possible to see many artifacts found in the Eruscan archeological sites in the area. You can also request additional information about the Archeological Park at the museum. You should not miss a visit to the beautiful Santa Margherita Sanctuary, patron of the city, and to the Girifalco Fortress. Both are on the highest point on the hill and are easy to reach after a short, uphill walk. Following the path that follows the city walls, you can also enjoy a beautiful view over the surrounding countryside. The Girifalco Fortress, constructed for military purposes, has undergone many substantial changes throughout the centuries and today only a part is open to the public. Various small shops on the main streets of Cortona offer local handmade items and gastronomical products. Great red wines are made in the area (we are just a few kilometers from Montepulciano and Montalcino) and all of the wine bars offer a wide selection. There are many restaurants in the city, most offering traditional local and Tuscan cuisine (the Chianina cattle, one of Italy's oldest, high quality bovine breeds is bred in Valdichiana). Just outside of Cortona's walls you'll find the Franciscan hermitage Le Celle, the first monastery built by Saint Francis of Assisi in 1211, where a small community of friars still lives today. Through the course of the centuries, the hermitage was restructured and enlarged several times but Saint Francis's small cell has always been conserved in its original state and can be visited today. In summer, Cortona organizes the Tuscan Sun Festival, an annual event dedicated to the arts which sees the participation of several international stars and artists. 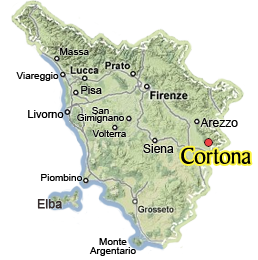 On Booking.com you can see a list of all the best Hotels in Cortona, with detailed description, high-res pictures and reviews from former guests. Reserve online at the best Internet prices (guaranteed) and pay directly at the hotel. The charming and intriguing town of Cortona, beckons from its position dominating the Val di Chiana, and offers the unsuspecting visitor many opportunities to experience a fascinating aspect of Tuscany. From the Etruscans, to the Romans, to the Medici Fortress, there is much to see and do while visiting this town just south of Arezzo. This mini-guide provides details on what to see, how to get there & a calendar of events. The Museum of the Etruscan Academy and of the city of Cortona offers numerous archaeological finds from the area from both the Etruscan and Roman periods, as well as an interesting art gallery with works by Cortona and Tuscan artists. Just on the outskirts of Cortona, Il Sole del Sodo offers both B&B or self catering apartments with private pool & garden. They are the perfect base for exploring Montepulciano, Arezzo and even Umbria! Reserve now and save your spot at dinner for their home cooked meals. The enchanting atmosphere in the hills between the Tuscany & Umbria border provide the perfect relaxing setting for this vacation villa with B&B suites. Plan your family vacation, destination wedding or yoga retreat in a lovely traditional environment.